As a young girl I was involved with both Camp Fire Girls (now the more inclusively named “Camp Fire”) and Job’s Daughters. Although neither was strictly a religious organization, both had strong overtones along those lines, which probably accounts for the deeply felt spiritual connection I hold to this day. Worship God – We’re free to interpret this one, and I hear it as a call to have some sort of spiritual practice, even if that means sitting on a beach contemplating the wonder of it all. Seek Beauty – This law encourages us to “look for the good in all people, places, things and nature” — a wisdom I can’t argue with. Pursue Knowledge – The law in full reads: “Try new things. Experiment with a new skill. Learn more about something you already know.” Excellent, and I would add, “Pursue higher education,” because I believe in its power. Be Trustworthy – It would be difficult to have a good life without abiding by this. Hold onto Health – I had a major revelation about ten years ago: “Life is energy.” Put not-so-simply, without good, lively energy to see us through the day, life can be hellish. Maximize your chances by doing all the things They tell us to do and avoiding the enemies of vitality. You know the list. Glorify Work – This law reads “Do the best you can with everything you do. Be proud of your work. Finish what you start.” I would modify it somewhat with an encouragement to “prepare yourself for and then seek work you feel passionate about.” A hated job is a one-way path to misery and despair. Be Happy – A lot of people get confused about this one, wondering how they can be happy when there is so much to be miserable about. If you’re still unsure, with an open heart and a willingness to entertain a different point of view, Google “happiness quotes” and start reading. Here’s a good resource. Many wise and learned men and women have had much to say over the centuries about the wisdom of choosing happiness. Acknowledging that it can be a choice is the first step to achieving joy. I learned quite a bit about quite a lot when I was a Camp Fire Girl: how to lay a fire, how to swim, how not to rush the process of toasting marshmallows (useful as metaphor), and how to work towards something I find meaningful: in those days, achievement patches. 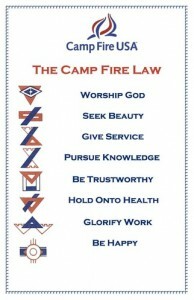 Along the way, and especially as I grew older, I wish I’d given more attention to the eight Laws. Anyone seeking a brief guide to a good life would find these a step in the right direction. Nicely done, Camp Fire. I was taking my walk this afternoon, enjoying the movement and freedom after a morning spent studying. As I was crossing Austin Street something caught my eye: a little brown bird — perhaps a baby — was huddled down almost in the middle of the street, wings splayed, looking frightened, definitely wounded. I looked around as if expecting…what? His mother to show up and take him home? Someone to drive by and help me? A man on a bicycle wobbled by with two young kids not far behind. Aha – help! “Do you live on this street?” I asked hopefully. Plan #1 was to at least get the bird out of the street, because any car moving from south to north was going to squish it. He shook his head regretfully and moved on. I continued to stand guard over my charge, kneeling frequently to check on him. I thought I saw a little blood in his beak. Every now and then he closed his eyes as if against the onslaught of such unthinkable vulnerability. I knew he needed help quickly. I saw a well-dressed woman carrying flowers across the street, apparently to her neighbor. “Excuse me!” I yelled. “Do you have a shoebox?” She didn’t, but after some explanation she agreed to get me a bag, so there I was in the middle of a busy street, a giant Whole Foods bag in hand, gently scooping a tiny shivering life form. I practically ran home. And, I confess that some of my thoughts along the way were along the lines of “Why me?” In the universe next door, I hadn’t noticed the bird and was continuing my walk. In this universe, however, I had a task. 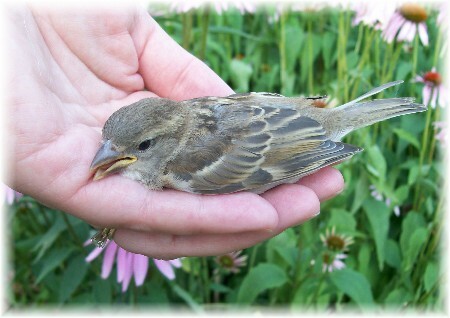 Several months ago Neal and I rescued a bird which had flown into our front window, so I knew exactly what to do with a hurt bird: place it in a shoebox lined with a soft cloth, poke holes in the lid, then keep it in a warm, quiet cat-free place until you can get it to a rescue center. I checked the Sonoma County Bird Rescue Center website and to my amazement they are open 7 days a week. The thing is, I hate driving. I hate driving with a passion and I especially hate driving the almost-one-hour trip to Santa Rosa, which I do too many times a week. Nevertheless, I knew I was going. Neal said he’d go with me; I drove. Every now and again I asked Neal to peek under the lid to see how Sami was doing — yes, I had named him — and Neal would give me reports like, “He’s just looking around,” and my heart would melt to think of it. As I drove, I marveled at my good fortune living in a place where an injured animal could get medical help — likely provided by tender-hearted volunteers — seven days a week. “God bless America,” I said out loud to no one. Three very nice staff members were waiting. The gave Sami a number (0567 — an awfully big number for such a tiny bird) and told us we could call back in a few days to see how he’s doing. They asked where we found him because they try to return healed animals to their own territory. Because sometimes, convenient or not, it just is.